There is a lot about the month Denis and I spent in the UK that I won't be sharing with you-- unless it's the stray photo here and there-- because we spent days throughout that time with family. There are still two more posts to come about places I want to share with you, but they're both posts about the wild places of Scotland that wrapped their icy, breathtaking fingers around my heart and squeezed tight. 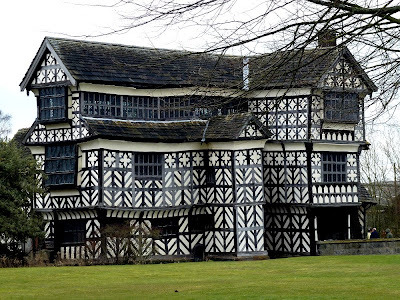 Little Moreton Hall is all about me falling head over heels in love with a house from the very first second I laid eyes upon it-- a house over 500 years old that seems to have been built with me in mind. I've said before that one of the things I wanted to do during this trip was to scout out half-timbered houses. 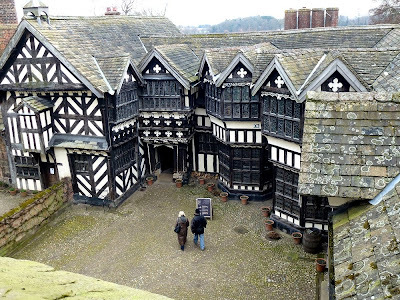 I found a jewel of a half-timbered great hall at Rufford Old Hall, but the diamond I found was Little Moreton Hall outside Congleton in Cheshire. I'd made a list of places I wanted to visit well in advance of ever getting on the plane to the UK, and when Denis and I sat down to plan our itinerary, I paid attention to any days the places were closed, and their opening and closing times, but very little to the tiny photos in the National Trust handbook. 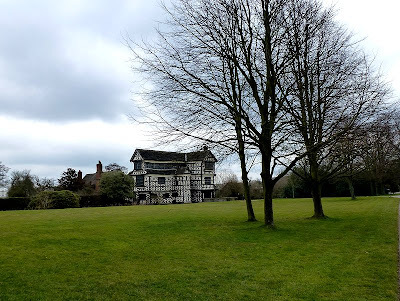 When Denis and I drove to Little Moreton Hall, I was walking into the place with an open mind... or a blank slate (although I hesitate to call my mind that for obvious reasons). There was a fairly substantial car park when we turned off the highway. We walked into the new gift shop, showed our Royal Oak membership cards (that get us into any National Trust property for free), and I paid scant attention to all the merchandise on the shelves. Once back outside under the gloomy skies and ever-present icy blasts of wind, I looked over a selection of plants for sale until I mentally slapped myself. What was I doing? It's not as though I could take any of them back with me to Phoenix! As Denis and I began to follow the path leading to the house, the first thing I spied was the blasted remains of a tree. As it seemed to be off by itself, it's little wonder that lightning seems to have paid considerable attention to it. 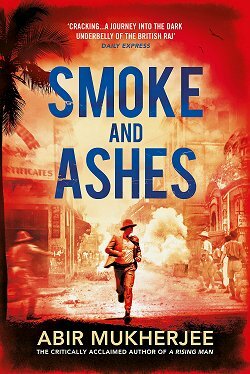 And since I've shown you my first photo, I'd better remind you that you can click on any of the photos in this post to see them in larger sizes. No right clicking needed-- they'll open right up in a new window. We walked past a hedgerow... I looked to the left... and there it was. 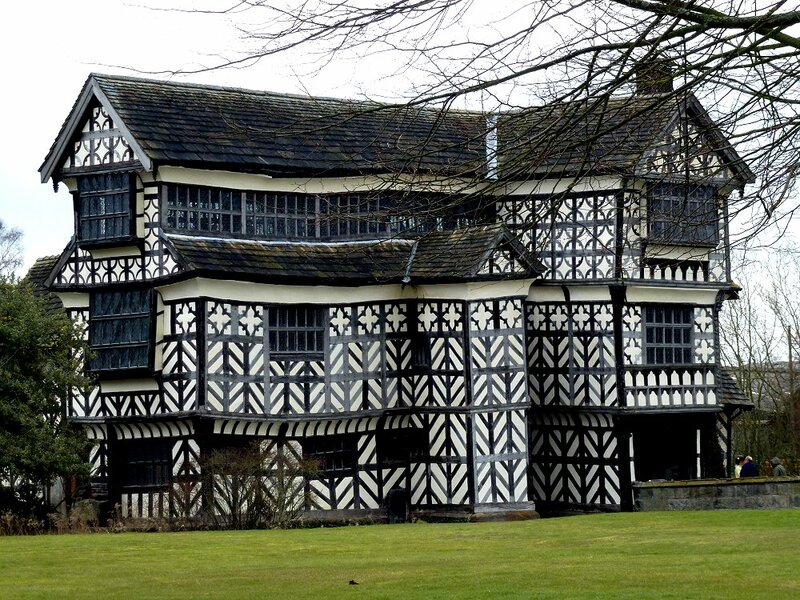 Little Moreton Hall. I was in love. 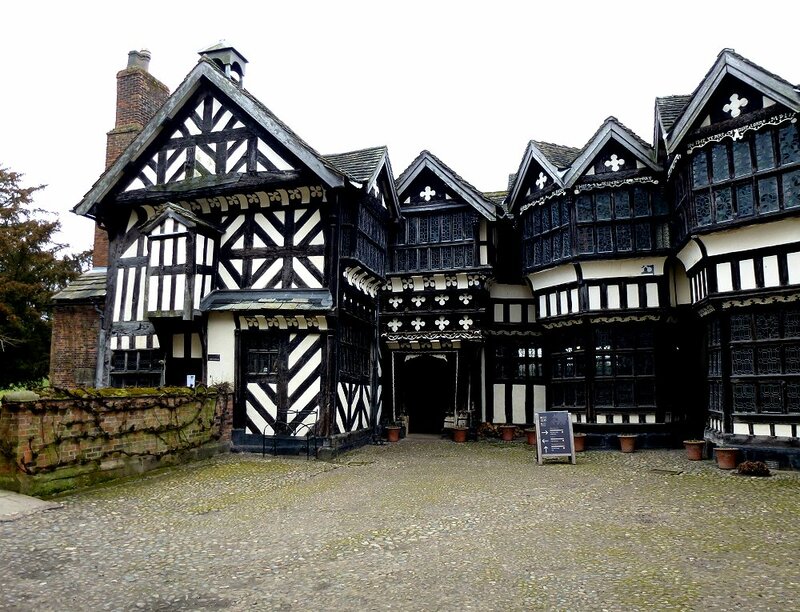 Little Moreton Hall stayed in the Moreton family for almost 450 years, until ownership was transferred to the National Trust in 1938. 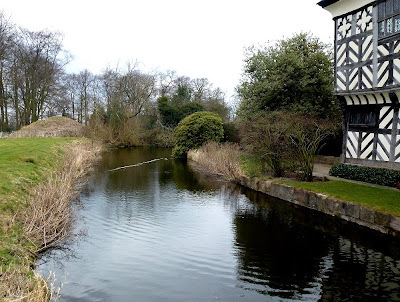 It was about now that I realized that we would be walking on a sandstone bridge over a moat. A moat? Be still, my heart! I heard some quacking and turned my camera in time to take a photo of the "jet trail" left by a speeding duck as it disappeared around the corner and on down the moat. Hmmm... my reputation must have preceded me! Past the gatehouse and into a small, cobbled courtyard. That door ahead was drawing me like a powerful magnet, but I ignored it. 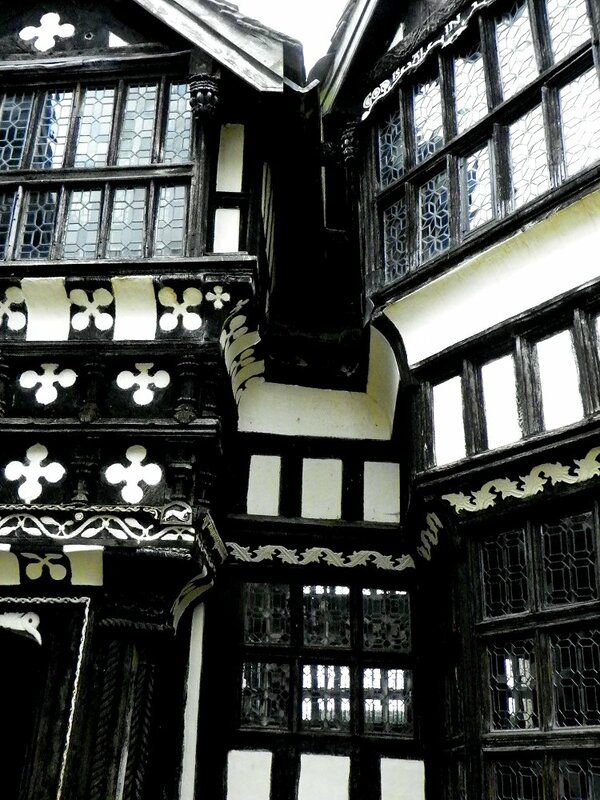 The part of the house in front of me was the oldest, and contained the Great Hall. To the left of the door was a wing added on which used to contain the kitchen, buttery, etc. Now that wing houses a small tea room and café. Denis asked me if I wanted to eat lunch there, but I have to admit that I waved him off. This house wasn't just speaking to me, it was singing, and I wasn't the slightest bit interested in food at the moment! As I continued to look around the courtyard, the occasional glint would make a window pane sparkle in the weak light, and I began to look closer at the windows. 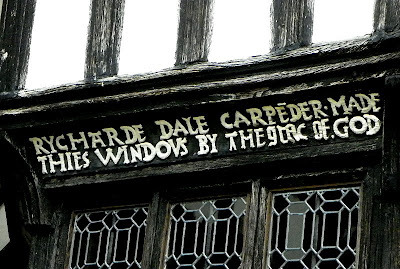 The panes were in all sorts of different designs, and-- I would learn later-- there were over 33,000 individual panes of window glass at Little Moreton Hall. One of the things I love best about this sort of house is the fact that some highly trained, highly paid architect had no part in its construction. There is so much whimsy to be found, various parts of the building leaning on each other as if in need of support, all the different sorts of ornamentation-- and those windows. 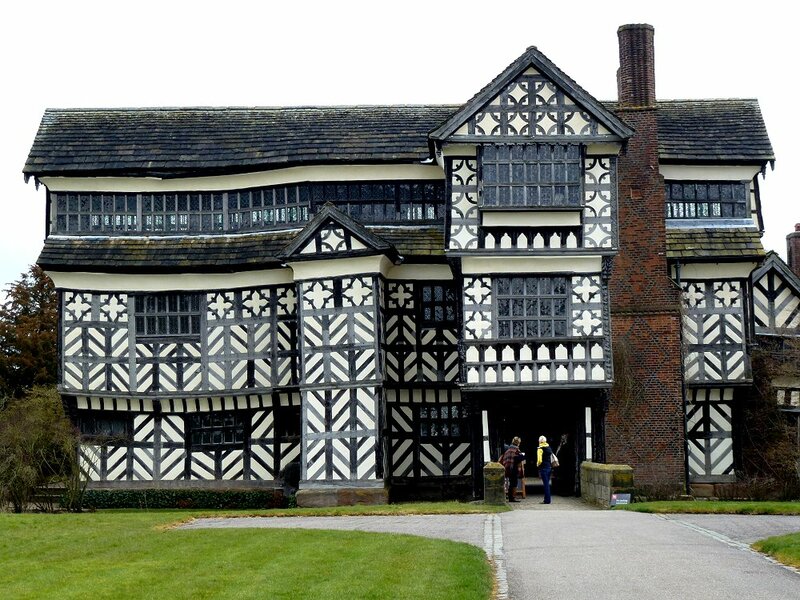 Little Moreton Hall was built to impress, and I was. So much pride was put into building it. 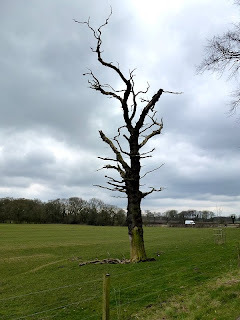 Even though the place did fall on hard times, with a succession of tenant farmers living in it, once renovations on it began, I would think it didn't take all that much before the pride reasserted itself. 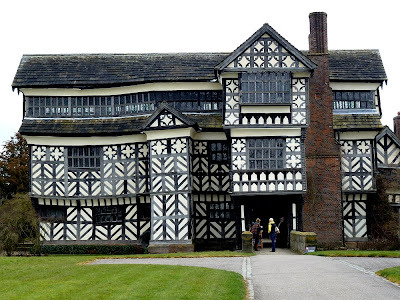 Little Moreton Hall was built to be a happy place, and even through the Arctic chill of the day, I felt the house's warm glow spread within me. Speaking of that wind, I still wasn't ready to go inside even though I was trying not to shiver! "In the year of our Lord 1559...."
"Richard Dale Carpenter made these windows by the Grace of God"
If I had anything to do with the building of this place, I would want people down through the centuries to know it, too! 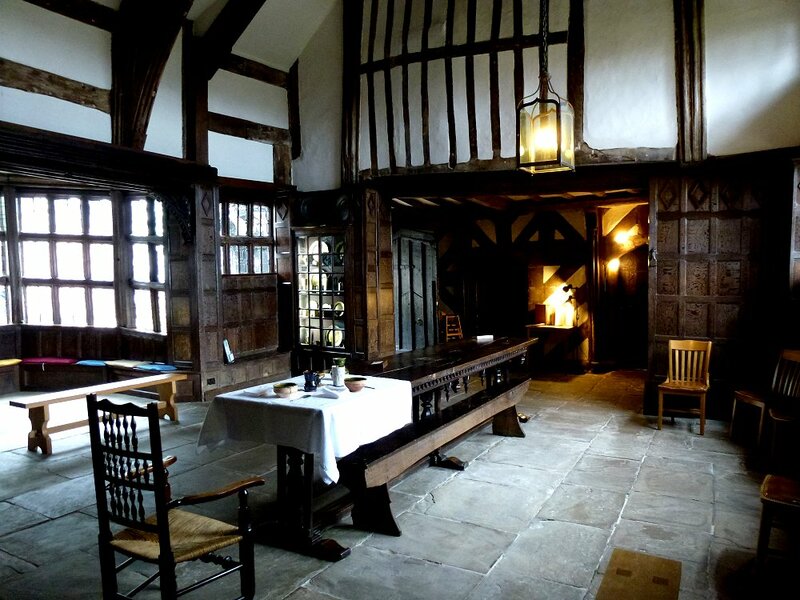 There's a large bow window to the left in the photo above, and the refectory table you see is one of three pieces of furniture that are original to the house. The small table with the lamps on it and above it to the right hold menus to the tea room whose entrance is to the right of the table. The door remained closed to keep the heat in. There was a fire lit in the Great Hall, and I came back to it more than once for its warmth and to talk to the National Trust employees there. And-- I admit-- to sit quietly and soak up the ambiance. The large bow window in the Great Hall... and those window panes! There were National Trust employees on hand throughout the building to help. Some of them were in period costume, like the lady to the right. One of the times I was in the Great Hall, a woman came in with some sort of suitcase. She opened it and began to take out tools. 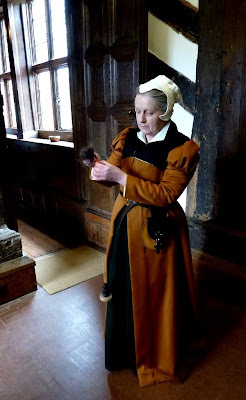 In talking with her, I learned that she worked for the National Trust, and she was there to begin the cleaning process on the windows in the Great Hall. I won't bore you with the steps in the process, but the work is very labor intensive and very painstaking to keep these ancient windows in good repair and looking their best. I can't remember the woman's name... Diane? Deborah? I should've made note of it because she was extremely friendly, helpful and informative. We found out that--even though we live thousands of miles apart-- we have a lot in common. The round table in the Parlor is another original furnishing. These painted panels were discovered when the Georgian wooden paneling was removed in 1976. 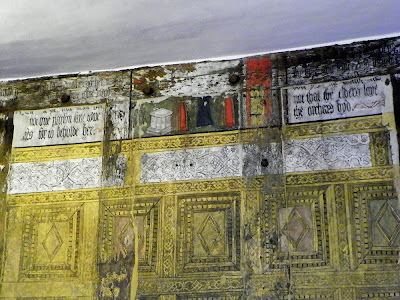 This type of decoration was quite fashionable from 1570 to 1610. 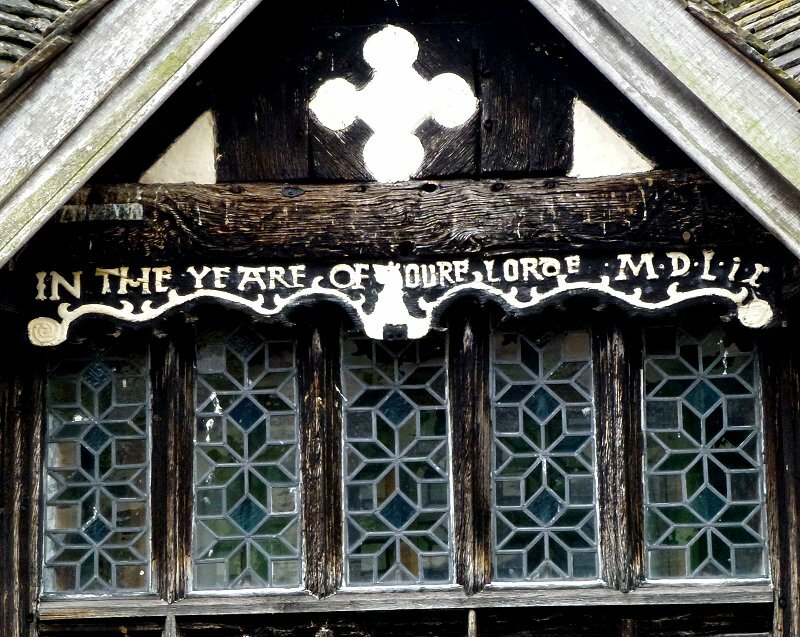 Not all of the rooms in Little Moreton are open to the public. Some National Trust employees live on site, some rooms are being worked on, and some are store rooms. But there are treasures to be found upstairs! That is, if you don't mind climbing a flight of very narrow, very steep stairs! Looking up isn't bad, but I have to admit that looking down from the top reminds me that I have vertigo! At the top of the house is the 68-foot-long Long Gallery, where residents could exercise in bad weather. In fact, four early seventeenth-century tennis balls were found behind the wood paneling here! 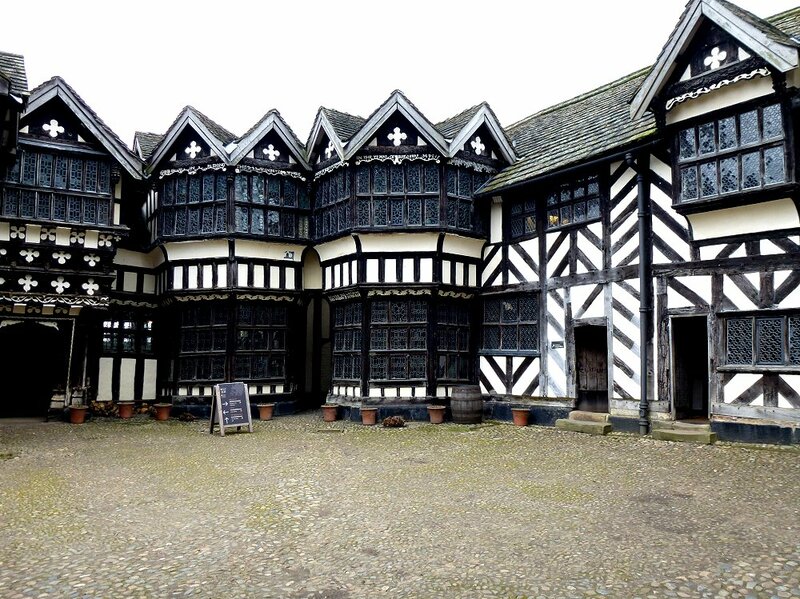 The Long Gallery was roofed with heavy gritstone slabs which caused the supporting floors below to bow and buckle. The floor has waves in it much like the sea. Everything is well supported now and isn't about to fly apart, but the bows, buckles, and waves that remain only add to the charm of Little Moreton Hall. Let's walk more of it. Here's where clicking on a photo to see the detail comes in handy. But if you don't feel like doing it, the plasterwork says (in modern English), "The spear of destiny whose ruler is knowledge." 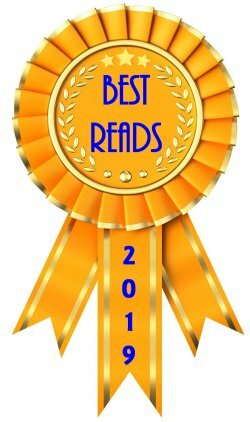 For those of you who aren't in the mood for a close-up, the translation in modern English is, "The wheel of fortune whose rule is ignorance." In a book that listed the author's choice of England's Thousand Best Houses, Little Moreton Hall did not make the top ranking. Why? Because-- for the most part-- it's not furnished. Granted, that is a negative, but I honestly did not feel the lack of furniture at all. All the Tudor history books, all the Tudor historical fiction that I've read over the years helped my mind furnish these rooms in what would have been the style of the day. 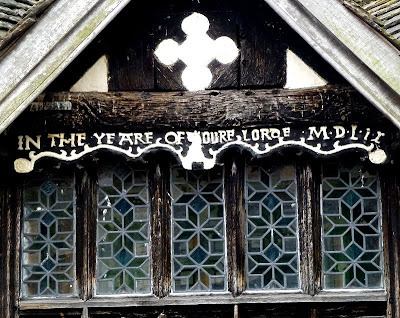 If you do like to visit stately homes for their furnishings, you may want to give Little Moreton a miss-- but I hope you don't. Especially if your imagination likes to come out and play. 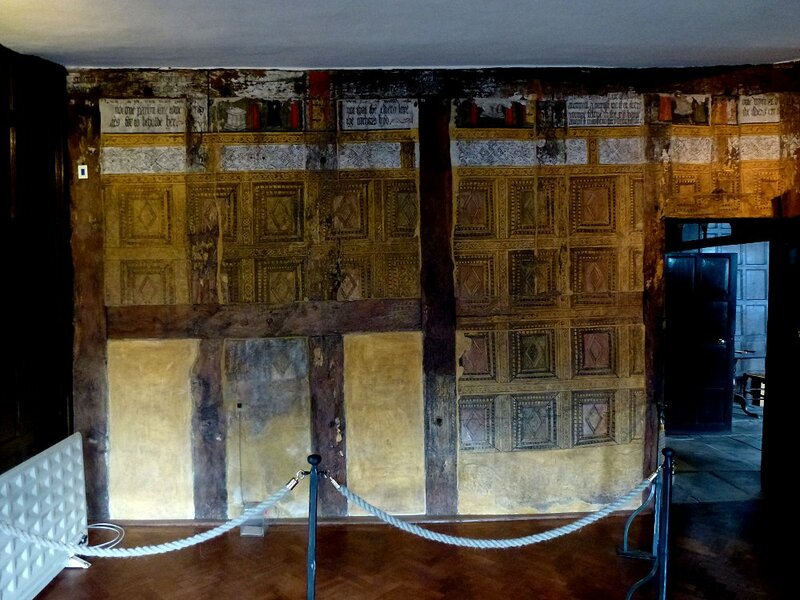 William Moreton's son (also named William) was the owner who added a state-of-the-art garderobe. That's loo...er... bathroom to you. Now if you're wondering about the plumbing in that day and age, don't. There wasn't any. If you were to sit down in that garderobe on a cold winter's day, you'd definitely feel an icy breeze on your nether regions. You see, the moat at Little Moreton Hall isn't just a status symbol (it was never meant for defense). The garderobes all empty directly over-- and into-- the moat. Hmm... summer days were probably a mite fragrant at times! We did have lunch in the tiny tea room, partly because while I was waiting for Denis, I watched an almost endless parade of locals going in to eat. 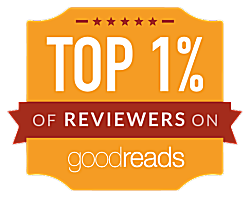 I knew that if the locals liked it, then our taste buds would rejoice. They did. While we ate and chatted, I contemplated the raid I would shortly be making on the gift shop. 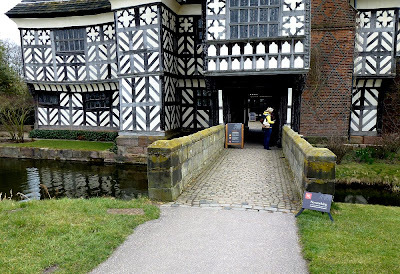 I hadn't paid much attention to it on the way in, but I knew if I liked Little Moreton Hall, I would be spending money on the way out. 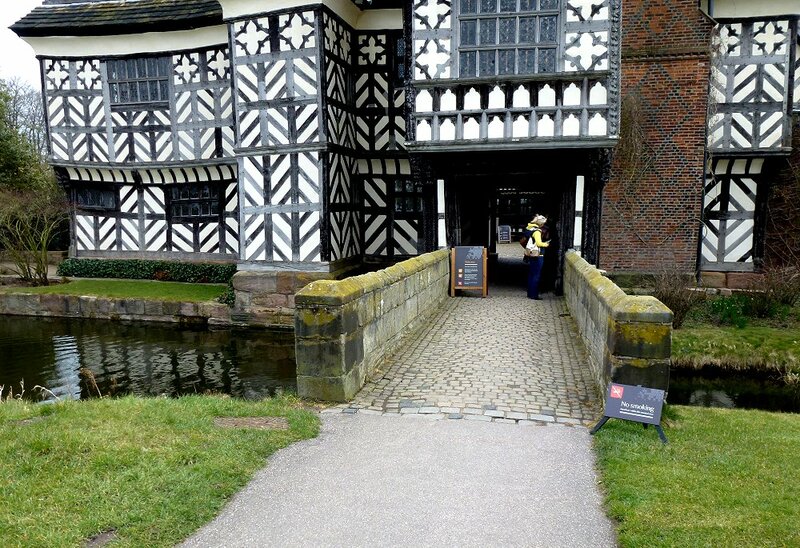 I spent more money at Little Moreton Hall's gift shop than I did anywhere else during our month in the UK! But it was time to think of leaving the house that had taken such a firm grip on my heart and my imagination. 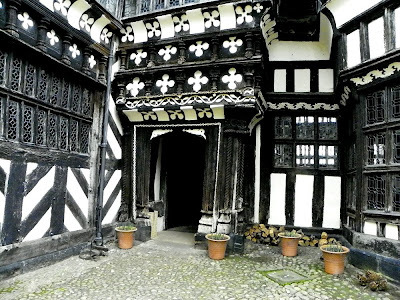 I didn't want to, but I made myself walk out the Great Hall door and out into the courtyard to face the gatehouse. Standing at the door to the Great Hall, I looked across the courtyard. To the large entrance way. To all those panes of glass in the windows. To the patterns in the blackened timbers. And on up to the Long Gallery. And then I reluctantly walked across the courtyard. 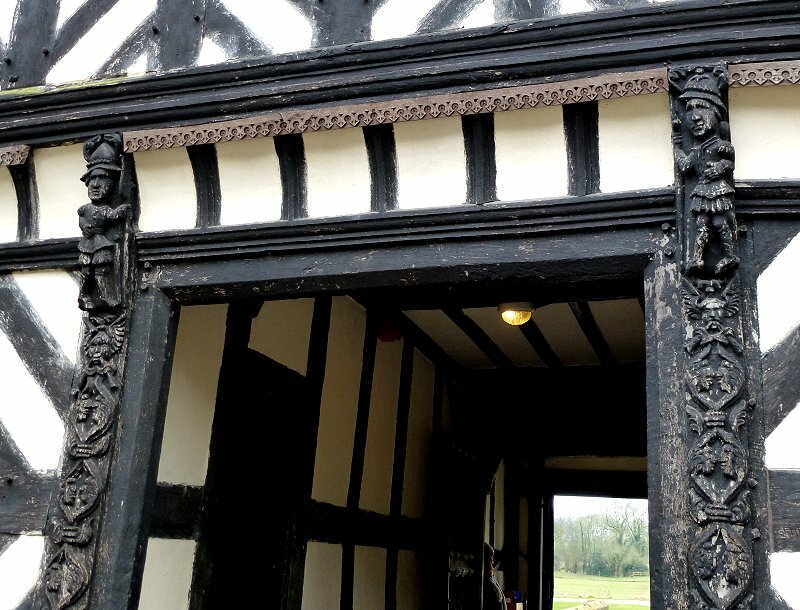 I spent more time looking at all the carving over the entrance way past the gatehouse. These builders, these carvers... every one of them took pride in their work and wanted it to last forever. We all need passions like that. 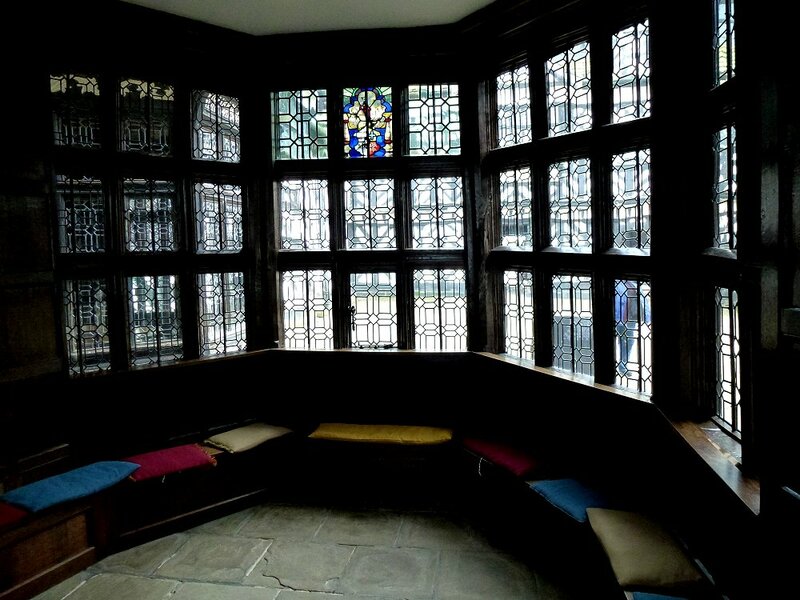 Remember that open window in the Long Gallery that could be seen in the photo taken from the Great Hall door? Well, this is how the courtyard and Little Moreton Hall looks from that open window. I love all the varying rooflines. I love the fact that there are no straight lines. I can imagine how those 33,000 window panes can glint and glimmer when the sun shines. I can certainly appreciate how comforting and warm a fire in the Great Hall fireplace is on a bitterly cold day. I can picture myself feeding the ducks that swim in the moat-- and looking for ducklings in the spring. 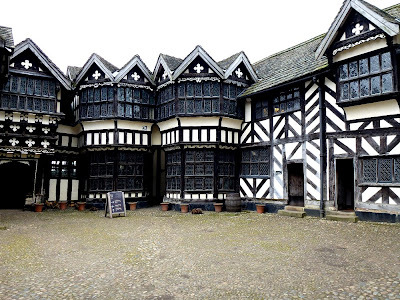 There is so much I can imagine at Little Moreton Hall. Thank God it's still here for us all to enjoy. Oh, this takes me back - I used to live not far from Little Morton Hall. It's one of my most favourite of all houses. Can you imagine what it must have been like to live there - well, I can see you can! I would love to - apart from the plumbing arrangements. 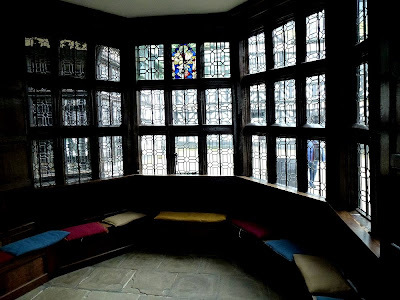 But I could just see myself walking in the Long Gallery whilst the wind blew and the rain lashed down outside, or sitting reading on a window seat beneath those wonderful windows in the Great Hall. And the outside - it does my heart good just to see your photos, never mind actually being there. I feel a trip coming on next year! 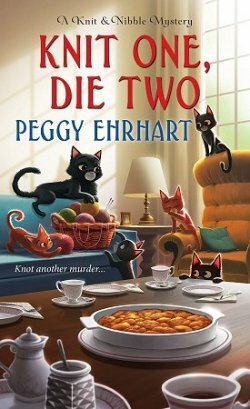 I hope you get to make that trip, Margaret. Denis and I would love to go back sometime in much warmer weather. Cathy - What a gorgeous house! No wonder you love it. It's so beautifully preserved, too. I have to say I wouldn't have wanted to live in those times, but still... And a moat, too? Gotta love it. Hello, what a beautiful building. I'll have to go sometime.